Topics: Curvy Pen, Pocket Jotter & Pen, Torino Pen, San Antonio Pen, and Rubik's Roller Pen. 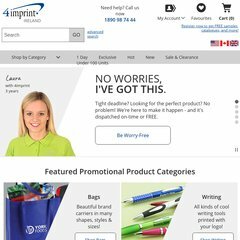 4imprint.ie Promotional Clothing | Printed T-Shirts | Corporate Clothing from ..
On average 4.50 pages are viewed each, by the estimated 140 daily visitors. ns2.4imprint.com, and ns1.4imprint.com are its DNS Nameservers. It is hosted by 4imprint England, using Microsoft-IIS/7 web server. The programming language environment is ASP.NET. PING www. (80.169.157.19) 56(84) bytes of data.